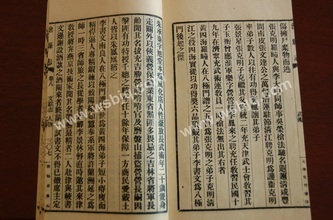 You will find above some pictures of the Cang county records (沧县志). These records were compiled around 1929 and published in 1933 by the local government of Cang county. 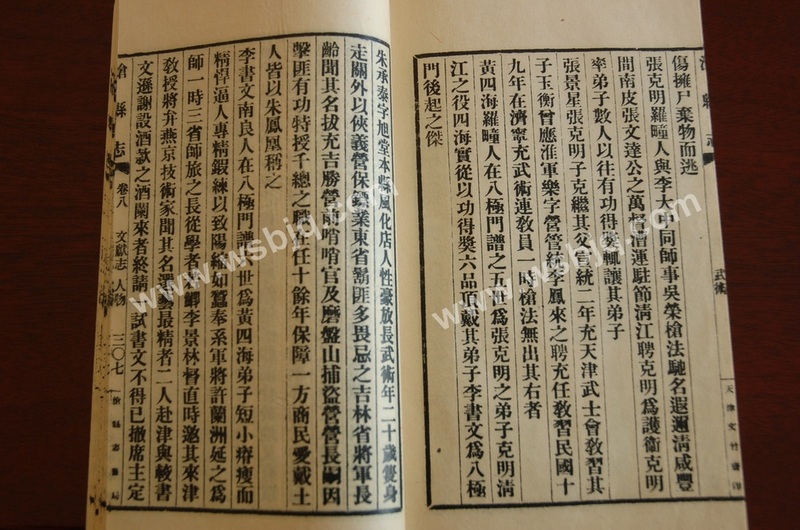 The "martial arts" section of the records spreads over about 15 pages only, and contain historical data about some local martial artists (BajiQuan and other styles). The data on BajiQuan were in all likelyhood provided by the LuoTuan branch of practitioners (probably Han HuiQing). 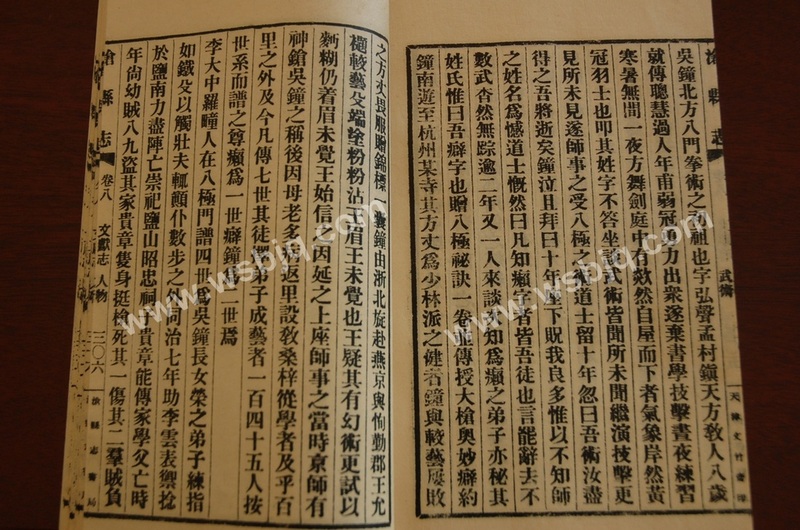 Hence, at the exception of Wu Zhong, they focus on the life of people issued from LuoTuan (Li DaZhong, Zhang KeMing, etc.). One will note that in these records, Li DaZhong and Zhang KeMing are reported as disciples of Wu Zhong's daughter (Wu Rong, 吴荣) instead of Wu Ying (吴溁, Wu Zhong's adoptive son, see section on "Wu Ying"). According to the Wu HuiQing 1936 manual, Li DaZhong was the first practitioner from LuoTuan who came in 1846 to MengCun to study BajiQuan. At that date, Wu Rong had already passed away (or else she would have been over 80 years old), so it is more likely that the LuoTuan people were taught by Wu Ying. One will also note that Wu Zhong is quoted as founder of "BaMen Quan," instead of Baji or BajiMen Quan, which is maybe due to a misprint in the record. "Wu Zhong, founder of northern BamenQuan, also named HongSheng (弘声), was a muslim from MengCun town. At the age of eight he was bright and surpassing people. When entering adulthood, he was outstandingly brave and strong, he gave up literary studies in favour of martial arts. He was training day and night, in winter or summer without stopping. One night, Wu Zhong was playing with his sword in his yard, when an impressive looking Daoist priest wearing a yellow hat jumped down from the roof of the house. Wu Zhong asked him about his name but the man did not answer. The man sat down and started to talk about martial arts. Everything the man talked about was totally unheard to Wu Zhong. Then the man made a demonstration of his skills, and everything he showed was totally unseen to Wu Zhong. Wu Zhong acknowledged the daoist as his teacher and learned BajiQuan from him. The man stayed 10 years with Wu Zhong and one day, he suddenly declared “now you have learned all my skill, I am going to leave”. Wu Zhong kneeled down crying and said to him “I have been 10 years at your side, you taught me so many things, my only sorrow is that I don’t know the name of my master”. The daoist answered “the ones who know my name is Lai (癞) are all my disciples ». The man left after saying this and disappeared without a trace. Two years after, another person came to meet Wu Zhong and presented himself as a student of Lai. The man kept his name secret and only said “my name is Pi (癖)”. 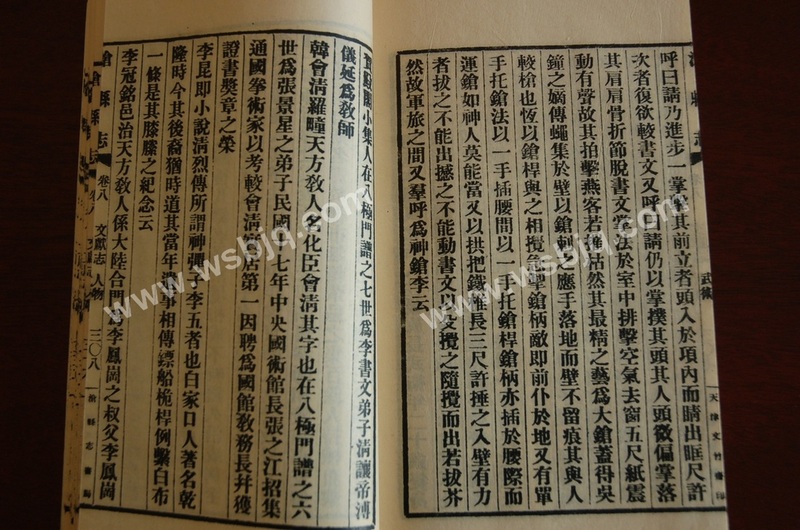 The man gave Wu Zhong a manual about the secret mastery of Baji Quan and taught him the deep secrets of big spear. Pi invited Wu Zhong to travel southward, to some temple in HangZhou. The abbot of the temple was very skilled in ShaoLin, Wu Zhong tested his skills against him and defeated him repeatedly. The abbot acknowledged Wu Zhong’s skill, and awarded him a bag of prizes (or a bag of flying daggers, depending on transcription). Wu Zhong returned from ZheJiang to YanJing (ancient name of BeiJing). 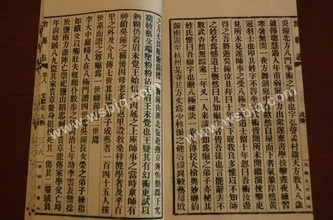 Wu Zhong tested his skill with YunTi (also called YinTi), the prince Xun. Using a Shu (ancient bamboo weapon) with white powder on the tip, he managed to touch the Prince’s eyebrow without the Prince noticing it. The Prince thought it was a magic trick, so he tried again using the white powder, but again his eyebrows were touched without him noticing. 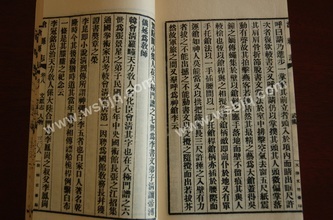 The Prince acknowledged Wu Zhong’s skill, he offered him a seat of honour and treated him as his teacher. At that time, Wu Zhong got the name of “god of Spear” in BeiJing. Later, because his mother was old and ill, he returned to his place of origin to teach the people in his native place. People learned from him up to 100 miles around. Up to now, seven generations have passed; his disciples took apprentices who developed his skill, and they represent up to 155 persons. According to the genealogy record, Lai should be respected as the first generation, Wu Zhong and Pi as the second generation."